EDITORIAL NOTE. As little as most Americans know about the military, they know even less about the military chaplaincy. For instance, do the chaplains get their sermons from God or the Pentagon? Below is a press release talking about the duties of chaplains. Although it is a little sterile, it is good and insightful. My memoir, Gun Totin' Chaplain deals with most of these things. 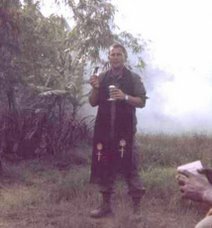 All chaplains are different and it is merely one chaplain's approach to doing ministry in combat. the most hardened soldier look toward a higher power. oversees his brigade's six chaplains. "A chaplain's main purpose is to be a representative between Soldiers and the commander," said Locke. "The religious program is the commander's, we just run it." ultimately here to uphold every Soldier's privilege of worship." 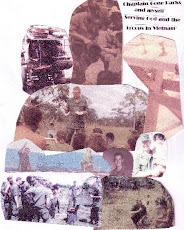 part of the chaplain's work. weapon, I don't feel any need to, because he does such a great job." bodyguards, since the chaplain is a noncombatant." The assistants, besides training on common tasks and Soldier skills,coordinate with units for training, environmental leave and deployment briefings, prayer breakfasts, and retreats. some heavy burdens. "We're trained to recognize the symptoms of combat stress and suicide," he said. "And we know basic intervention. We're also the funds clerks. "higher moral character" than other Soldiers. "I'm the most irreligious guy you'll meet, especially compared with my comrades who go to church every week," Frickie said. "But I like being around the different people. I've learned a lot about different faiths since I've been in the Army." chaplain and his assistant are seldom of the same religious affiliation. religious preference," said Hansen. "It may not be the same." can bring them, enhances them." services, but that's not their primary workload, Locke said. helicopters, and I have memorialized many of them." But he isn't going to give it up. and realize that God is the only one who can fill that. deploy and leave their spouses behind with little support." speaks about what there is after life." "Most Americans are religious," said Bryan. "Soldiers are no exception, and war causes many participants to consider life and death. Not only does freedom of religion help Soldiers deal with the issues of war, it helps support the very freedom of religion they fight for." Locke. Making sure that all soldiers are taken care can be difficult. 'minority' faith groups are in dire need of chaplains." In many cases, Soldiers can fill in as lay leaders for worship services. In others, religious doctrine forbids full services without the presence of ordained clergy. minister to faith groups in different places." Despite the frustrations, said Locke, he loves his job. Enlisted for four years in an aviation job, he planned to become a warrant officer and pilot before his life changed course. "I met a chaplain in Germany who really made me think," he said. "I felt God calling me - but was the Army preparation for a mission, or was it my mission?" best job in the Army." Tanya, a former Marine helicopter pilot in Iraq and now the mother of two, will soon undergo serious surgury. Her husband, also a Marine just back from Iraq, is home with her for the surgery. The good news is that she is in a super hospital: Loma Linda. When I was in the 82d, we had a massive jump into the Mojave Desert and had six paratroopers killed and 200 of us were banged up pretty badly. We all went to the Loma Linda hospital. I remember it like yesterday. They were so great and really looked after us. I was limping and hobbling around visiting the banged up soldiers and a nurse corralled me and said, "You look like you could use a cup of coffee." Well, I knew that was impossible because in the 7th Day Adventist, coffee is verboden. We went into her office and she opened up the bottom drawer and there were all these packets of coffee. A lifesaver and an example of how great they were. So, Tanya is in good hands. I will fervently pray. God bless Tanya and the children and the father.